I’ve been working through a variety of Abstract-Challenge challenges that I’ve neglected or omitted over the past year. This one is for the “Landscape” theme of November, 2005. I focussed on the colours of the landscapes around me and the elements of the landscape that speak to me. I also restricted myself to using only pieces of other landscapes; chunks cropped or cut from larger landscape hangings. I’m pretty happy with it. Just need to finish the edge – ran out of thread. The basic premise of the group is that the list owner releases a theme or word at the beginning of each month. 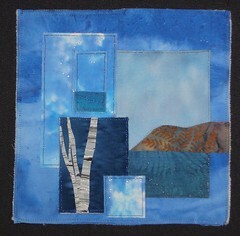 The challenge is to express a concept in an 8″ by 8″ square quilt using abstract representations. Discussion is encouraged on how one would depict the chosen concept (a different one each month), including pictures, etc. of the conceptualizations. Next Post African or American?